Included are a description of each process, the tasks or steps that are typically performed, key factors to consider when planning and developing MPC, and what to look for when developing MQOs and assessing performance and corrective actions. Definitions and examples of MPC and MQOs are provided below. In all cases, the UFP-QAPP is the primary document directing the MR work. Two key measures of quality used in MR projects are IVS and blind seeds, which are the basis of GSV. The concepts behind the use of these tools are discussed in more detail in Section 6.1. The IVS is used whenever DGM and AGC methods are employed. Blind seeding within the production area must also be performed. Analog detection methods use an instrument test strip that is similar to an IVS but is not considered part of the GSV process because it lacks a recorded response and the rigorous evaluations made for digital systems (USACE 2015). For the purposes of this document, the term IVS is used for these methods as well. Blind seeds can be applied to processes including surface clearance, subsurface detection and clearance, or soil screening. Installation of IVS and blind seeds is discussed further in this chapter. Requirements are developed to clearly define the standard for a completed process or MR project. The PDT must develop and agree on the requirements for key processes before the MR field activities begin. This consensus is usually achieved during the systematic planning process (SPP). The results of SPP are documented in Worksheets #9, 11, 12, 22, 31, 32, and 33 of the MR-QAPP. Any of these factors may be critical to the quality of work for one site, while nonexistent for another. The PDT decides which factors are included in the MR-QAPP. When appropriate, processes should be organized into definable features of work (DFW). DFW are those activities that undergo QC inspection. Each DFW should have definitive performance criteria (MQO), monitoring requirements, and recommended corrective actions for when failures occur. Ideally these DFW, performance criteria, and monitoring requirements should be described in Worksheets #12, 17, 22, 31, 32, and 33 of the MR-QAPP. Specific task activities should be described in Standard Operating Procedures (SOP) referenced in Worksheet #17 and attached in an appendix to the MR-QAPP. Blind QC and validation seed detection. Analysis of background variability across the site. Accuracy/Completeness 100% of validation seeds must be detected. Review of validation seed detection results per survey unit. Once following assembly Field Geophysicist/ Initial IVS Memorandum/ Project Geophysicist Response (mean static spike minus mean static background) within 20% of predicted response for all transmit/receive (Tx/Rx) combinations. RCA/Corrective Action: Make necessary adjustments, and reverify. Site preparation tasks prepare the site for general site operations. Several processes may be required to prepare a site for MR activities. A general description of site preparation processes follows, focusing on activities that are applicable to project DQOs. These activities support overall site operations and provide the basic infrastructure to support the personnel, equipment, and processes to be used at the site. Process steps may include site office and sanitation facility setup, siting and installation of portable explosives storage magazines, installation of barriers as required to control site access and exclusion zones, setup and testing of communications networks, establishing site survey control, surveying and installing grid corner points, and surveying other relevant site features. Also, during this phase of the work contractors may install stormwater pollution prevention barriers, establish equipment laydown areas, mark soil stockpiling locations, and perform other activities to support mechanized operations. Contractors may also initiate measures to protect sensitive habitats, species, and cultural resources. [DQI: Accuracy] – Positional check of a known monument not to exceed a horizontal error of ± 10cm (0.328 ft). [DQI: Accuracy] – Static data (collected for at least 5 minutes) over a newly established control point show that the points are within ± 10cm (0.328 ft) of the known coordinates. [DQI: Completeness] – Grid corner points installed for all grids. [Verify Correct Assembly] – GPS equipment (base station and rover units) are inspected daily to verify the individual instruments are set up correctly according to the SOP and are functioning properly (for example, receiving the minimum acceptable number of satellites). [Instrument Function Test] – The positioning accuracy is verified daily by checking it against a known reference point. The data from the verification checks is saved and verified by QA/QC. [Verify Correct Assembly] – Handheld detectors used for anomaly avoidance while installing grid corner pins are inspected daily to verify correct assembly/setup/function according to the SOP. The purpose of vegetation removal is to clear the site of unwanted vegetative growth to support the safe and effective implementation of follow-on MR processes. While vegetation removal may seem relatively straightforward, inadequate preparation of the MR site may make the implementation of follow-on processes less effective and potentially more hazardous due to poor surface visibility. Examples of some follow-on processes that may depend on adequate vegetation clearance are surface clearance and geophysical survey. Vegetation removal on an MR site may range from minor grass cutting and limb trimming to complete removal of all vegetation. Specific decisions regarding clearance method are often influenced by munition sensitivity, terrain, impacts of disturbance on the landscape, presence of threatened or endangered species, cultural features, current or reasonably anticipated land use, and available technology. PA/SI: Limited vegetation removal, if any, is required in geophysical data collection area. RI: Limited or moderate removal is required, often only in geophysical data collection area and intrusive investigation areas. RA: The most extensive removal is required in this phase to allow 100% geophysical data collection coverage and intrusive investigations. Common tasks associated with vegetation removal include grass mowing, limb trimming, tree removal, and mulching. On some sites, controlled burning and deforestation using mechanized equipment (such as a hydraulic axe) may be appropriate. In almost all cases, management of logs, stumps, and mulch is required. During vegetation removal activities, properly trained UXO technicians should be performing anomaly avoidance procedures to ensure worker safety. [DQI: Accuracy] – “At least 80% of the ground surface must be free of vegetation and visible for inspection.” This specification should be determined by the project technical managers and based on requirements to support follow-on MR processes. [Verify Coverage] – All accessible area has been mowed to within 6 inches of the ground surface. [Verify Adequacy] – All trees smaller than 6 inches in diameter have been removed and the spacing between all trees is sufficient for the geophysical sensor to pass. [Validate Schedules] – Schedules should account for how fast the vegetation For example, is there a maximum amount of time during which the follow-on MR processes must be performed to avoid removing the vegetation again? Surface clearance is the process of removing UXO/DMM and MD up to the size of specified dimensions from the site. These items are typically detected by UXO technicians using analog instrumentation. PA/SI: Surface clearance is not required. RI: Limited or moderate surface clearance is required in geophysical data collection and intrusive investigation areas. RA: The most extensive surface clearance is required in this phase to support 100% geophysical data collection coverage and intrusive investigations. Divide the work area into grids and the grids into search lanes. Mark the grids and lanes (for example, using paint, pin flags, ropes, or professional land survey or other preapproved location survey method to mark survey areas). Walk the search lanes and inspect the ground—either visually or with the aid of geophysical sensors—to detect UXO/DMM and other metal scrap on the surface. Remove material documented as safe (MDAS) and other metal scrap and mark UXO/DMM with flagging tape or pin flags for later removal. Document the results of the surface clearance, including identifying munitions types, number of finds, and locations. Assess the origin of identifiable MD to confirm CSM (for example, pounds of MDAS). Conduct QA/QC inspections as specified in the MR-QAPP. Complete the Surface Sweep Technical Memorandum for lead agency acceptance. [DQI: Representativeness] – blind seeds placed at the site by the contractor (QC) and QA (government or independent). Blind seeds will be distributed such that the field team can be expected to encounter between one and three blind seeds per day per system. [DQI: Completeness] – 100% of the accessible area is cleared. [DQI: Accuracy/Completeness] – 100% of blind seeds were recovered. [Verify Coverage] – Grids are subdivided into marked search lanes providing overlapping lane coverage within each grid. [Initial Instrument Function Test] – Handheld instruments are checked daily in the IVS. [Verify Coverage] – All blind seeds are recovered from within each completed search grid; all UXO/DMM and other metal debris are removed from within each grid to the size specification, or to the residual concentration stated in the MR-QAPP. [Verify MEC/MPPEH Management] – Verify removal and in situ disposal of MEC; verify proper inspection, classification, and management of MDAS and MDEH (material determined to have an explosive hazard). The term MDEH is only used when material that is hazardous is transferred outside of the contractor or DOD control, which should not occur on any MR project unless specifically authorized. The IVS is a component of the GSV process as presented in Chapter 6. Detailed guidance for the installation of the IVS is provided in the Geophysical Systems Verification (GSV) Plan, which is an appendix to the MR-QAPP. PA/SI: IVS is typically not required. RI: IVS is used to support geophysical data collection. RA: IVS is used to support geophysical data collection; multiple IVS locations may be necessary for large acreage projects. Locate a tentative spot to install the IVS and perform a surface clearance to remove all surface metal and debris. The IVS may be sited at a convenient location within the project site boundary. The general location is typically identified in the GSV Plan. Conduct a DGM survey at the IVS location, process the data, then reacquire and remove any metallic objects identified from the DGM data. If a large enough area is mapped, there may be clean area within that is suitable for installing the IVS without reacquiring and investigating anomalies. Conduct a confirmation DGM survey at the IVS location to verify that no metallic contamination remains; repeat as needed to establish a ‘clean’ IVS site. Bury the test items (industry standard objects [ISO]) in a straight line at the locations, depths, and orientations specified in the GSV Plan. Survey the final locations using survey grade Differential Global Positioning System (DGPS). Establish a background noise test strip and offset from the IVS line as specified in the GSV Plan. Conduct a post-installation DGM survey of the IVS and test strip. The DGM surveys can be conducted on the IVS and noise strip transects in any order or direction. Teams collect data prior to and after the survey of the IVS and noise strip. The DGM field team may use techniques such as collecting a three-lobed clover track path over an IVS corner pin or traversing back and forth along the IVS to determine the latency correction value. Nonmetallic survey tapes or ropes are placed on the IVS and noise strip transects (between survey hubs/markers) so that the DGM crew can maintain accurate real-time positioning. Prepare an IVS Installation Report. [DQI: Accuracy] – GPS positional check is performed of a known monument not to exceed a horizontal error of ± 10cm (0.328 ft). [DQI: Representativeness] – Response correctly reflects item interrogated. [DQI: Sensitivity] – 100% detection is achieved for all ISOs within the expected amplitude range; signal-to-noise is within the approved range. [DQI: Accuracy] – IVS test item anomaly locations are compared to known (surveyed) location is within project DQOs. [Verify installation of IVS] – QC/QA verifies installation of IVS through photographic evidence and written documentation showing items buried, at what depth, and depth measurement to geometric center. Blind seeds must be detectable as defined by the DQOs and located throughout the horizontal survey boundaries defined by DQOs. Blind seeds are typically distributed so that field teams can expect to encounter between one and three blind seeds per day per system. Blind seeding is an integral component of the GSV process and is required whenever metal detection (DGM or analog detection methods) is used (see Section 6.1). Blind seeding is a valuable tool for monitoring the compliance of geophysical and anomaly excavation processes with design specifications. All blind seed locations are surveyed, and survey locations and burial depths are verified by QC and QA. QC blind seed locations are firewalled from production teams and typically QA blind seed locations are firewalled from QC personnel. Blind seeds generally consist of ISOs of sizes similar to the munitions types common at the site. Surrogate munitions (inert items) may also be used when available. Blind seeds are typically installed at random locations, buried up to near maximum detection levels, and placed at a variety of orientations including those that produce the weakest signal in the detection instruments used. Blind seeds are typically installed at a frequency at which between one and three seeds should be found by each operator each day (for example, one seed per data set). For DGM seeding, seeds are typically buried with horizontal orientation (most difficult to detect) and at depths representative of the anticipated distribution of UXO/DMM at the site. Figure 7‑1. QA verification of BSI installation. PA/SI: Blind seeds are typically not required. RI: Blind seeds are used to support geophysical data collections; emplace seeds along transects or within 100% coverage grids. RA: Blind seeds are used to support geophysical data collections; emplace seeds to span the planned RA boundaries. An area determined in the QAPP around each seed emplacement is scanned with a handheld metal detector prior to emplacement to support anomaly avoidance. Holes are excavated with a shovel. As appropriate, the surface (such as grass or tundra) is peeled back prior to excavation of the hole to make the location less obvious. The seed item is placed in the respective hole and the depth measured using a rigid measuring tape. The civil survey team records the x, y, and z coordinates of the center of each seed to within the project DQO requirement. The hole is filled and covered (for example, the grass or tundra is replaced) and the location is restored as best as possible. The seed item type, coordinates, depth, and orientation (azimuth and dip) are stored in the project database and secured (password protected) so that only personnel with demonstrated need have access. [DQI: Accuracy] – GPS positional check is performed of a known monument not to exceed a horizontal error of ± 10cm (0.328 ft) or as specified in the QAPP. [DQI: Sensitivity] – Blind seed items (BSI) for analog detection methods are of the correct size and depth to only be detected by instruments functioning properly and being used correctly. BSI for DGM are buried at depths representative of the anticipated distribution of UXO/DMM. [DQI: Representativeness] – BSI are representative (size and depth) of the munitions at the site. [DQI: Accuracy] – Surveyed locations of BSI are within project DQOs. [DQI: Completeness] – Blind seeds are planted at rates required by the project. [Instrument Function Test] – GPS positioning accuracy is verified daily by checking against a known reference point. The data from the verification checks is saved and verified by QA/QC. [Verify Correct Assembly] – Handheld detectors used for anomaly avoidance while installing BSIs are inspected daily to verify correct assembly/setup according to the SOP. [Instrument Function Test] -Instruments are tested for proper functioning by checking them within an IVS. Daily equipment checks are generally documented in Team Leader logbooks and instruments are checked by QA/QC. [BSI locations are randomly selected within each production unit] – QC/QA verifies that BSIs are randomly placed within the grids/production areas. [BSI placement depth for DGM] – QC/QA observe placement and verify depth of burial is consistent with QAPP. [BSI locations are backfilled and restored to as natural an appearance as possible] – QC/QA observe placement and verify restoration of the site. If any of these components are lacking, the overall geophysical system may not be able to effectively locate geophysical anomalies that should be selected for investigation. Digital geophysical mapping – These systems map with instruments that digitally record geophysical measurements and georeference the data where each measurement occurred. Traditional DGM is primarily used for detection surveys. DGM sensors also includes advanced electromagnetic induction (EMI) sensors that can collect data in either a dynamic or static mode, collect the data from multiple directions, and enable AGC of anomalies as either TOI or non-TOI. Analog detection methods – These methods use instruments that produce an audible tone, a meter deflection, and a numeric output (or a combination of these alerts), which an operator interprets in real time. Various DGM data collection designs may be selected to achieve the DQOs, depending upon the MR phase of the project. Potential designs include meandering paths, transect, or 100% coverage DGM surveys. Transects are approximately evenly spaced data collection paths often designed using VSP. VSP statistically calculates a percent confidence level of traversing and detecting a target area with a specified circular radius, which is defined using knowledge from the CSM. PA/SI: Meandering path data collection paths provide initial information on the anomaly density. RI: Transects, 100% coverage grids, or 100% site coverage are used for smaller sites to determine the anomaly density and identify high and low anomaly density areas. RA: A 100% coverage approach is used to detect anomalies for physical removal. IVS tests are conducted twice daily, before data collection begins and after data collection concludes. Both tests must demonstrate results within the acceptable DQOs for the data to be accepted for processing. The IVS tests confirm that the sensors are operating correctly and being carried/driven correctly (ISO amplitudes within specification) and that the positioning technology is operating to specification (ISO interpreted location within error of known location). For 100% coverage areas, walking DGM teams enter the grid and collect data, generally in a back and forth routine similar to mowing a lawn. If towed systems are used, the data collection scheme may include towing the sensor around the border of the grid in decreasing paths, and finally collecting the handful of strips remaining in the center (again, similar to lawn mowing). Lane spacing is generally established so that each subsequent sensor run overlaps the previous one. A variety of techniques are used to identify survey lanes for the teams. The objective in all cases is data collection over 100% of the accessible area within the grid. Accessible area is generally defined by the PDT considering worker safety and any physical limits to the technology being used. Acceptable data (which have passed both IVS tests) are processed following an approved SOP. The SOP specifies tolerances for adjusting the data for lag/latency and for filtering. The current industry standard software (Geosoft Oasis Montaj with UX-Detect) automates many of the processes and logs all the data processor actions so that the results can be independently verified and repeated. Anomalies are generally autoselected using the software (peak picking) and then reviewed by qualified individuals. In addition, the data are plotted on contour maps with target selections marked and qualified personnel review the auto-selections against the visual data and often select additional anomalies to add to the target list. The final products from data processing are the target list with the distinct target number, coordinates, and amplitude for all the anomalies above the selection threshold, and a map showing the anomaly by target number. Additional QC information is generated and published for each grid of data as well. This information includes how and when the data were processed, what parameters were used, and any notes from the data processor. The map also shows areas where discrete anomalies could not be selected because the anomalies were high amplitude and spatially large, or areas that were inaccessible, making data collection impossible. For each of these areas, polygons are generally assigned and numbered, and these areas are addressed with a modified or alternate approach, such as analog detection methods. Airborne geophysical surveys can be conducted using either magnetic or EMI sensors. Primary challenges to these kinds of surveys include getting the sensor close to the ground (for example, it must fly high enough to clear obstacles), which directly influences detection and expense. Airborne surveys can be cost effective for conducting gross assessment of very large areas. These surveys have not been dependable for generating maps of discrete targets to be used for clearance. 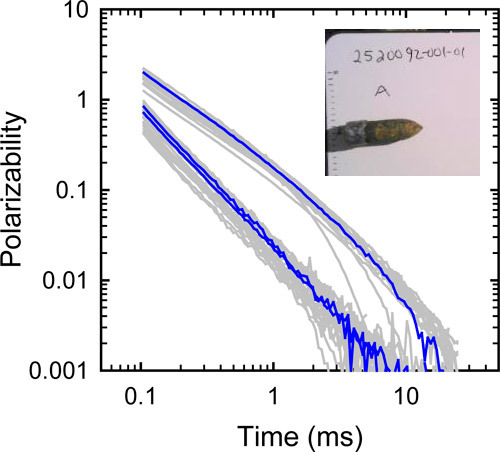 [DQI: Sensitivity] – Describe the project specific detection threshold (for example, a threshold of ≥ 1.7 mV/A and SNR ≥ 5 is required to detect a 37 mm projectile lying horizontally at a depth of 0.3 m). [DQI: Accuracy/Completeness] – Detect 100% of blind seeds and account for 100% of area. [DQI: Completeness/Comparability] – Complete project specific databases and target lists delivered. [Verify Correct Assembly] – Assemble and configure equipment according to the SOP. [Initial Instrument Function Test] – Response (mean static spike minus mean static background) within 20% of predicted response for all channels. [Initial dynamic positioning accuracy] – Derived positions of IVS targets are within 25 cm of the ground truth locations. [In-line measurement spacing] – 100% ≤ 0.25 m between successive measurements. [Lane spacing and overlap] – 100% ≤ 0.7 m cross-track measurement spacing. [Dynamic detection repeatability] – QC seed response must be ≥ 75% of minimum predicted response at geometric center of anomaly. They provide a precise anomaly location. Anomalies can be investigated immediately. Often analog methods can be conducted in more rugged terrain with steeper slopes and with fewer vegetation constraints. Analog methods are useful to augment a visual surface clearance where tall grass, bushes, or other vegetation may hide MEC/MPPEH from sight. These methods can also reduce the number of clutter items where metallic saturation exists (such as in the central portion of an impact area) to enable the use of digital systems to meet project objectives. Analog methods might be accepted in limited instances if circumstances preclude using better performing technologies. Reliability of analog methods depends heavily on operator training and demonstrated performance. TOI vary in size, depth and metallic content and soil types can vary across a single site. Initial and follow-up training as needed combined with demonstrated performance (varying the location and depth of test items in an analog instrument test area) and a rigorous blind seeding program are mandatory to achieving quality with analog methods. Various analog detection survey designs can be selected depending upon the MR phase of the project to achieve the DQOs. Potential designs are the same as DGM designs and include meandering paths, transect, or 100% coverage surveys. Transects are approximately evenly spaced data collection paths often designed using VSP. PA/SI: Meandering path data collection paths to provide initial information on the anomaly density. RI: Transects, 100% coverage grids, or 100% site coverage for smaller sites determines the anomaly density and identifies high and low anomaly density areas. RA: Typically, 100% coverage is used to detect anomalies for physical removal. Subdivide the area (grid) into marked sweep lanes typically not wider than five feet, which is the normal extent that an instrument may be swung from side to side while maintaining a consistent height above the ground. Operators enter the sweep lanes, one lane per operator and generally staggered to prevent interference between instruments. Operators sweep the detector from side to side, maintaining a height above ground as specified in the SOP as they progress from one end of the sweep lane to the other. As anomalies are detected, the operator either marks the anomaly with a flag or pauses and conducts an intrusive investigation, whichever method is specified in the SOP. [DQI: Accuracy/Completeness] – Locate and recover 100% of blind seeds. [DQI: Completeness] – Sample portions of the area (swept) to determine of anomalies remain unresolved that should have been flagged or dug. [DQI: Repeatability Surveys] – Zero anomalies remain unresolved that should have been flagged or dug. [Verify Correct Assembly] – Handheld detectors are used for anomaly avoidance while installing BSIs are inspected daily to verify correct assembly/setup according to the SOP. [Instrument Function Test] – Instruments are tested for proper functioning by checking them within an IVS. Daily equipment checks are generally documented in Team Leader logbooks and instruments are checked by QA/QC. [Verify Correct Sweeping Techniques] – QC/QA verify that operators are using the correct detector settings, using the correct sweeping techniques, and are sweeping at the correct pace to detect anomaly if present. 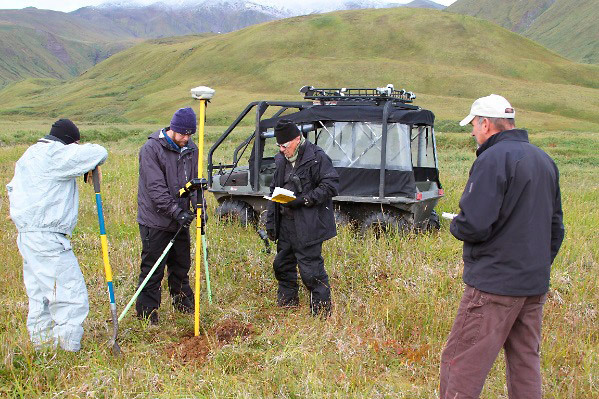 The sensors used for AGC include the geophysical tools capable of exciting and recording the full EM response pattern from an object and georeferencing geophysical measurements. The advanced EMI sensors used can evaluate anomaly selection criteria to analyze the characteristics of the buried metallic item. Using the item’s intrinsic characteristics (polarizabilities) as the basis, the buried metallic item can be classified as either TOI or non-TOI. TOI are items that must be correctly classified and excavated to accomplish site remediation goals. All munitions, QC and QA seeds, and other items designated by the site team, such as significant pieces of munitions, are TOI. Some site teams may even include selected fuzes and other components to the TOI list. Munitions need not contain high-explosive filler to be classified as TOI; anything that must be excavated and examined to determine whether it is hazardous should be included in the definition of TOI. The advantage of using AGC is that it significantly limits the number of targets requiring intrusive investigation, thereby reducing the overall cost for remediation while still removing TOI. Additional technical information on AGC can be found in Geophysical Classification for Munitions Response Sites (GCMR-2). DOD has instituted an accreditation program DAGCAP for contractors who use this technology. DAGCAP requires AGC contractors to meet stringent accreditation based on ISO/IEC 17025, General Requirements for the Competence of Testing and Calibration Laboratories. AGC data collection designs are implemented in cued and dynamic modes and may be selected depending upon the MR phase of the project to achieve the DQOs. Cued mode is a data collection scheme in which the user positions the sensor at discrete XY locations previously identified by other means (also referred to as static or stationary measurement). PA/SI: AGC is likely not economical to support mobilization and data collection for any limited data collection that is necessary. RA: AGC can classify anomalies for physical removal or to leave in place by using cued mode on detected anomalies following a DGM survey or using dynamic mode to support 100% DGM coverage of the site. Surface sweep. A comprehensive surface clearance may be required to detect, identify, and remove the UXO/DMM and other metal debris from the surface of the production area to support detection surveys ahead of AGC. In this application, a Technical Memorandum may be required following the surface sweep, with review and a visual site inspection by the lead agency. Detection survey. A dynamic detection survey detects and locates geophysical anomalies at the site. The detection survey may be conducted using DGM procedures (such as EM61) or it may be conducted using an advanced sensor (such as MetalMapper) in dynamic mode, following similar procedures. When the DGM (detection survey) data are used for AGC, a Target Selection Technical Memorandum is prepared that addresses data analysis, target density, list of selected anomalies, suggested background locations, and maps. A similar memorandum should be encouraged for simple DGM detection surveys. Furthermore, a Detection Survey DUA Report is required for AGC and encouraged for DGM. The DUA Report evaluates the usability of the detection data for its intended purposes, taking into consideration anomaly density, background variations, and other usability factors. The DUA Report identifies which areas of the property contain suitable geophysical conditions for applying the data to its intended purposes. Cued interrogation. Anomalies selected from the detection data and reported in the Target Selection Technical Memorandum undergo cued interrogation using one of the advanced sensors. Background data are collected at the recommended background locations. Cued data collection includes daily IVS testing and ongoing function testing as specified in the QAPP/SOPs. Cued data are generally validated daily (for example, verifying size and decay rate thresholds for each anomaly) and validation is reported weekly to the lead agency. Data processing. Data processing involves isolating the signal due only to the detected source from all other interfering signals from sources such as geology, instrument noise, or metal in the instrument, then inverting the data to generate polarizability decay curves that are used for library matching, cluster analysis, and predicting the size, shape and wall thickness of the buried objects. See Figure 7‑2 for an example of decay curves. Cluster analysis. In many projects, the range of potential UXO/DMM items are unknown. Figure 7‑2 also includes overlapping polarizability responses or a cluster with similar features. A representative sampling (intrusive investigation) of these clusters is collected, and the final classified list of potential UXO/DMM is refined. Library responses can be used to help define clusters, and new types of UXO/DMM can be added to the library using this process. Figure 7‑2. Decay curve illustrating an example ‘cluster’ (courtesy of ESTCP). Identify the source of previously unidentified (not present in the library) target signatures that have been identified as ubiquitous to the site through cluster analysis. Any recovered TOI will result in an additional library entry based upon the recovered TOI signature, and the library match process is repeated. Identify the source of previously unidentified target signatures that indicate large cylindrical, thick-walled sources. These sources may indicate an ordnance type not presented in the CSM, and thus not represented in the site-specific library. Again, recovered TOI result in an additional library entry based upon the recovered TOI signature and the library match process is repeated. Identify the source of target signatures that are near the analyst threshold (the dig/no-dig point on the prioritized list). The decision metric, which is usually a measure of goodness of fit to a library entry, declines as the target shape deviates from the library representation of that shape. This metric is the basis of classification. The decision metric also declines, however, as the measurement SNR declines. The final analyst threshold must capture TOI with lower decision metrics due to declining SNR at the expense of including high SNR non-TOI targets with shapes that are not good matches to a library item. Selecting example low-SNR signatures near the analyst threshold informs the analysts about the trade-off and is used to decide upon a final threshold. Objects are ranked in order from those with the highest likelihood the item is a TOI to the highest likelihood that the item is non-TOI. Objects classified as inconclusive are included on the ranked list as potential TOI. The contractor identifies the stop-dig threshold between the TOI and non-TOI and adds, depending on project objectives, a select number of non-TOI beyond the threshold. Deliverables from the classification process include the final TOI/non-TOI spreadsheet, library match results, figures and maps, the dig list, the Cued Survey DUA Report and the Final Verification and Validation Plan. Excavate buried objects (intrusive investigation). Details on intrusive investigation are covered in Section 7.3. Verify the threshold and verify recovered non-TOI validation targets are consistent with the predictions based on the advanced sensor data. [DQI: Completeness/Comparability] – Library must include signatures for all munitions known or suspected to be present, as listed in the CSM. [DQI: Representativeness/Accuracy] – Background data will be collected at least once every two hours of cued survey data collection. Background locations will be selected such that background data will be representative of the various subsurface conditions expected to be encountered within each survey unit at the site. [DQI: Accuracy/Completeness] – Detect 100% of (QA) validation seeds. [DQI: Accuracy/Completeness] – Correctly classify 100% of all (QA) validation seeds in the cued survey. [DQI: Completeness] – Classify all detected anomalies as TOI, non-TOI or inconclusive. [DQI: Accuracy] – Confirm 100% of predicted non-TOI that are intrusively investigated are non-TOI. [DQI: Accuracy] – Inversion results correctly predict one or more physical properties (such as size, symmetry, or wall thickness) of the recovered items (specific tests and test objectives established during project planning). [Initial Instrument Function Test (MetalMapper)] – Response (mean static spike minus mean static background) within 20% of predicted response for all monostatic transmit/receive (Tx/Rx) combinations. [Ongoing Instrument Function Test (Instrument response amplitudes) – MetalMapper] – Response (mean static spike minus mean static background) within 20% of predicted response for all monostatic Tx/Rx combinations. [In-line measurement spacing] – 100% ≤ 0.20 m between successive measurements. [Coverage] – 100% at ≤ 0.7 m cross-track measurement spacing (excluding site specific access limitations, e.g., obstacles, unsafe terrain). [Sensor Tx current (MetalMapper)] – Current must be ≥ 5.5 A.
Intrusive investigation includes all activities related to reacquiring previously detected anomalies and excavating anomalies to the point they are unambiguously explained. Chapter 5 describes intrusive investigations in support of MRS characterization and intrusive operations in support of a physical remedy. In this section, intrusive investigation is understood to mean that the results from the excavation support different objectives and decisions, depending upon the MR phase. Two key aspects of intrusive investigation are anomaly reacquisition and anomaly excavation, which also include reporting the dig results. Intrusive investigation occurs once the geophysical survey process has produced a map of the site and a target list, or the subsurface anomalies are marked with pin flags or other marking methods. The UXO technicians navigate to the anomaly location marked by a pin flag. Often for DGM, the original detector is used to reacquire the anomaly and ensure the amplitude is reproduced. The technicians excavate the anomaly and record the results of the dig (such as item identification, depth, and orientation). A post excavation reading is made and recorded to ensure the amplitude has been reduced below the selection criteria. A geophysicist reviews the excavation results to ensure the excavated items are consistent with what was expected. The excavated item is identified and segregated for proper treatment/disposal and is removed and properly disposed of. The excavation is backfilled, and the site is restored to the specifications required in the approved project plans. PA/SI: Typically, no intrusive investigations occur. RI: Intrusive investigations are often conducted within a subset of grids. A random grid approach is developed in UXO Estimator to ensure a specified confidence level that there are less than defined number of UXO per acre are within the buffer area outside of the target area. RA: Typically, 100% physical removal occurs for anomalies to the specified anomaly selection threshold or TOI defined for that site. Reacquire and mark the anomaly locations (reacquisition). Reacquisition may involve simply loading the anomaly coordinates into the GPS rover unit and navigating to the point and inserting a pin flag at the location, then moving to the next. Excavate and identify the anomaly source. In some cases, earthmoving machinery may be used to remove overburden or to excavate adjacent to, but not on, the anomaly location. Final uncovering of the anomaly source is performed by hand. Some excavations are conducted completely by hand. Manage MEC/MPPEH in accordance with approved procedures. MEC is inspected for type, filler, fuzing, and condition and the Senior UXO Supervisor and UXO Safety Officer determine whether the item is safe to move. If safe to move, the item may be moved either to a nearby location for disposal with other located items or to storage pending scheduled disposal. If not safe to move, the item is blown in place (BIP). MPPEH not identified as MEC undergo two, independent 100% visual inspections to determine whether it can be classified as material documented as safe (MDAS). MDAS has no explosives components or residues. If not confirmed as MDAS, the material may be classified as MEC or, if transported, MDEH. SOPs specify procedures for identifying and managing MPPEH, including MEC, following strict DOD requirements. Conduct geophysicist review of intrusive investigation results to determine adequate anomaly resolution. This process confirms that the items removed from the ground in the intrusive investigation logically compare to the corresponding geophysical survey anomaly response in that location and that the post-dig amplitude response is below the selection threshold or fully explained. Backfill and restore the excavation. [DQI: Accuracy (Reacquisition)] – Reacquired DGM location are within 0.5 ft (15 cm) of the interpreted DGM anomaly location. [DQI: Accuracy (Intrusive Investigation)] – Correctly identify TOI or non-TOI with accurate depths, accurate weights, photos showing all dimensions of the objects, and accurate location of actual recovery. Correctly identify type, condition, and fuze condition of MEC, consistent with the Army TM or Navy OP Publications. Correctly assign MPPEH as MEC, MDEH, or MDAS. [DQI: Completeness (Intrusive Investigation)] – Completely and accurately fill in intrusive investigation dig sheets for each target. [Instrument Function Test] – Verify GPS positioning accuracy daily by checking against a known reference point. The data from the verification checks is saved and verified by QA/QC. [Verify Correct Assembly] – Inspect handheld detectors used for guiding intrusive the investigation daily to verify correct assembly/setup according to the SOP. [Instrument Function Test] – Check test instruments for proper functioning within an IVS. Daily equipment checks are generally documented in Team Leader logbooks and instruments are checked by QA/QC. [All BSIs are recovered and reported] – Excavate, identify, and report all BSIs that were placed for DGM and/or analog detection methods. [All no-finds (false positives from the DGM data) are independently investigated and verified by QC] – Typically 100% of no-finds are independently investigated by the QC team and a percentage also by QA to verify that they are a false positive from the data.